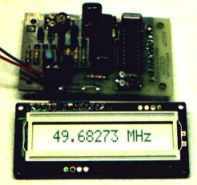 This is a nice frequency counter that reads frequency from 1 Hz to 50 MHz and displays it on a 16 character LCD display. Auto-range feature provides floating decimal point and automatic placement of suffix (Hz, KHz, or MHz). Gate speed automatically decreases to one second below 100 KHz to display frequency with a resolution down to an amazing 1 Hz. Auto-ranging with floating decimal point. Up to 7 digits displayed. Auto-adjusting gate speed (0.1 sec to 1 sec). Microcontroller-based circuitry provides for simplicity, ease of assembly, and highly stable readout. Sensitivity approximately 100 mV RMS (100 Hz to 2 MHz), 800 mV RMS @ 50 MHz.